For those who have a passion for food, owning a reliable set of cookware is absolutely necessary to ensure that your efforts don’t amount to a culinary catastrophe. And best of all you can whip up healthier meals with the right kind of cookware. But how do you know if you are making the right choice if you don’t know the first thing about non-stick cookware? Sure, late night infomercials and commercials do a great job of offering a dizzying array of cookware. A key selling point being how efficiently and quickly they can whip up a meal. And then they demonstrate how easy it is to clean up after use. But in reality, the so-called nonstick cookware as seen on tv is nowhere near the claims it comes on. We have done all the heavy lifting for you. In this best nonstick cookware set guide, we have rounded up 10 beautifully impressive nonstick cookware sets that’ll transform your cooking experience. Our selection is based on affluence, style, good food, and exceptional functionality. So if you want to dive in and buy or simply understand more about the best non stick pans on the market right now, please continue reading on. 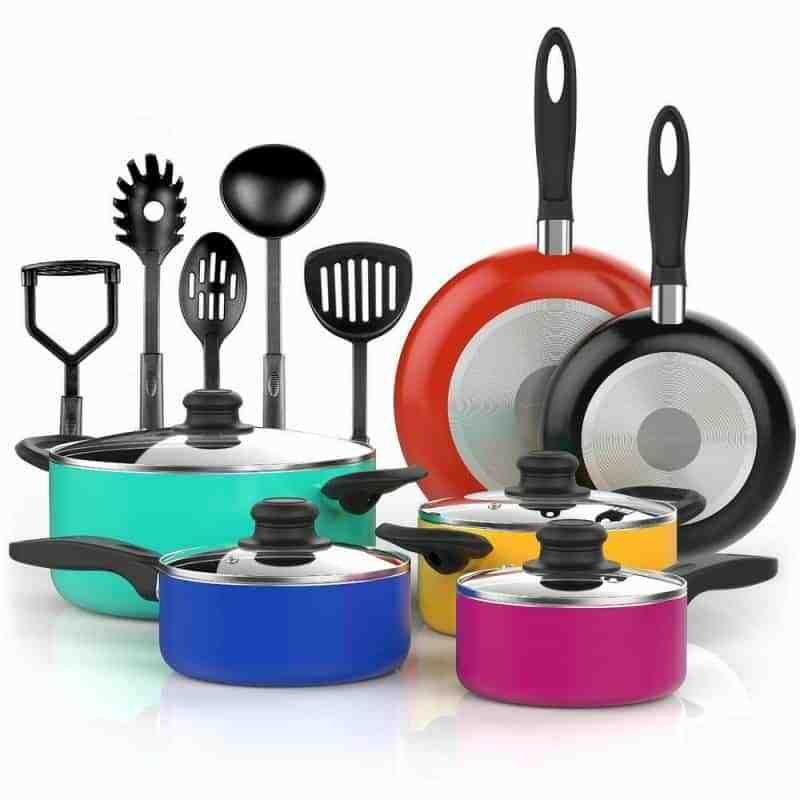 There are two main types of nonstick cookware: PTFE cookware and Sol-gel ceramic cookware. PTFE is one of the most popular types of nonstick cookware. It is durable, provides excellent nonstick performance and has a great reputation that precedes it. However, there are a few health concerns related to its manufacturing process. Plus, it has a rather volatile nature when exposed to heat which could be a deal breaker for some customers. Is PTFE Nonstick Cookware Safe? Nonstick cookware has become a favorite among many chefs. 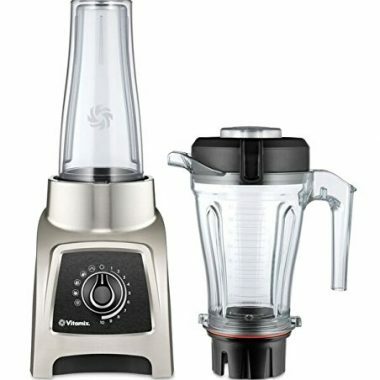 It is easy to clean and allows you to cook healthier meals with little or no oil at all. However, there has been growing concern regarding just how safe nonstick really is following the discovery that PFOA is used in the manufacturing process of almost all nonstick coatings including Teflon and PFTE. While PFOA has been eliminated from the manufacturing process, most manufacturers still use PFTE to make their nonstick coatings. It all boils down to the application. Being a nonreactive substance, PFTE is used in the manufacture of a host of medical materials including materials used in cosmetic surgery. So it’s perfectly safe. In fact, according to toxicologists at the University of North Carolina, you would ingest a flake scrapped off the bottom of a pan and it would still pass through the digestive system without causing you any harm. So as long as you handle PFTE cookware with care, it is the safest nonstick cookware you’ll find out there. When using PTFE cookware, it is essential to follow the manufacturer’s instructions. Most times, however, low to moderate temperature settings will suffice as long as they are well below 500 degrees, though some nonstick pans can withstand high heat without any problems. I know what you’re thinking. Don’t high-end chefs in infomercials preheat their pans before they start cooking? Well, yes they do. But if you do so, you’re only accelerating the deterioration of the pan. Plus you are also risking the possible release of harmful fumes too. It’s always a good idea to have a little oil in the pan before heating. What is the best non stick pan without Teflon? Search for a Sol-gel ceramic pan. Sol-gel ceramic is a relatively new type of cookware with a non-toxic chemical free construction. It is pretty good for what it’s worth but it’s not the most durable. You have to handle it with a lot of care. With top-rated cookware at your disposal, whipping up a sumptuous delicacy is a less daunting affair. Here are some key considerations that you need to keep an eye out for when selecting a quality new set. The best non stick pan sets are the sturdy ones with a heavy base as the heavy base will ensure that there is even heat distribution and in turn, reduce the risk of the nonstick surface getting damaged. By its very nature, nonstick cookware should have a minimum of three layers of reinforced nonstick coating. And if you can find cookware with more layers, the better. It should go without saying that any new pans you go for should have a smooth to the touch finish. However, while sprayed finishes often have a seamlessly smooth feel, rolled on nonstick finishes are often left with irregularities as a result of the rolling which could result in a less than durable finish. Therefore, you should check to ensure that the cookware you are buying has a smooth to the touch durable finish that can stand the pressure. As a general rule of the thumb, you should ensure that the material used in the construction you’re going for is good enough to withstand heat and the test of time. The stronger it is the better and the longer it will last. However, generally, if you are looking for a nonstick material that won’t disappoint, hard anodized aluminum is your best bet. While the rim design has nothing to do with the best quality nonstick skillet and pan sets, it is definitely something worth looking into if you are to have a seamless cooking experience. You are going to be using your pots and pans every day – sometimes even twice a day. Therefore, it goes without saying that the cookware you go for needs to be a rugged piece of equipment that can hold up well and stand the pressure of high temperatures. If you don’t want to replace your cookware after every few months, then you need to keep an eye out for durable material that will ensure your cookware delivers quality performance. Cookware handle materials vary depending on the type of cookware. Some have cool to the touch handles that you can comfortably hold without getting burnt whereas others require you to have pot holders to be able to get your cookware off the stovetop. Wood handles are to the most part cool to the touch which makes them the perfect for when you need to get food off the stove top without burning your hands. However, they are not oven safe and so you have to look for another set of pots and pans if you want to cook something in the oven. Stainless steel handles are the most common type of handles. They are oven safe up to 500 degrees but require potholders for handling. Cookware with silicone handles have the advantage of being versatile. They are oven safe up to 350 degrees and provide a cool touch when used atop the stove top too. However, you might want to use potholders when getting the cookware out of the oven because the handles tend to get a tad hotter in the oven. On average, are you more likely to use pots or pans? If you use more pans than pots, how many would you ideally like to have and how many pots would you like to have to complete your set? The number of pots and pans you need and which ones you need more of is a good place to start when buying a cookware set. Once you have found out how durable the set is, the material used in construction, the thickness of the cookware and all the other nitty gritties you have to think about how much you are willing to spend on the said cookware. Luckily, there are price points to fit any budget so you don’t have to worry about paying top dollar to get your hands on a nice set of cookware. There are plenty of price ranges ranging from as low as $50 to more than $200. And while cheap is often times expensive, nonstick cookware might not be the best simply because it costs top dollar. It mostly has to do with the material used in construction. But to be fair, most best rated cookware that costs a little more will probably be made from high-quality materials that should last years without so much as a scratch. 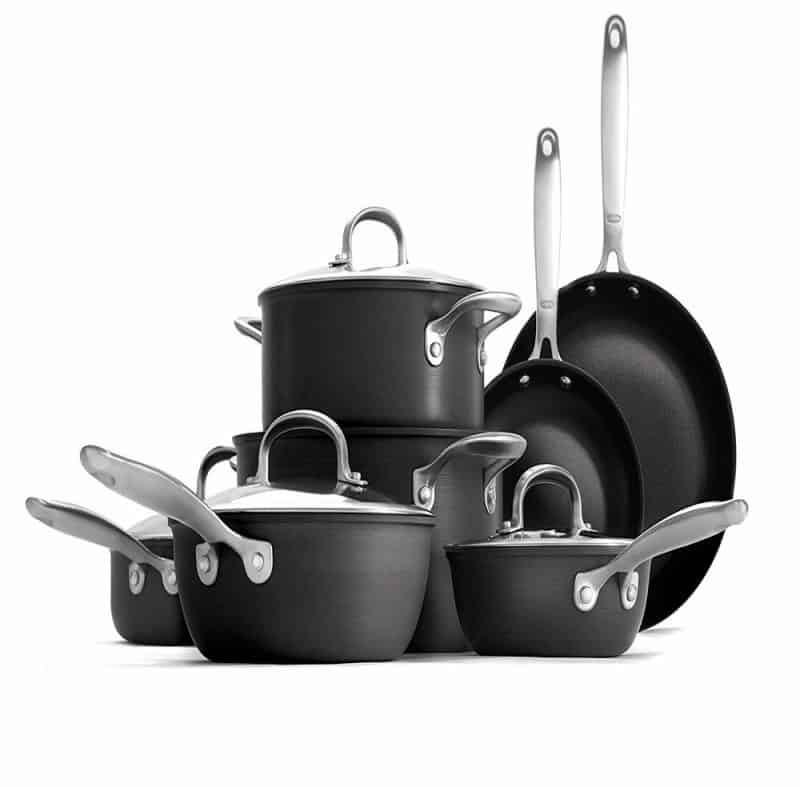 A basic set of nonstick pots and pans costs between $50 to $100. However, while this is fairly inexpensive if you are looking for a high-quality set of cookware that will provide long service, we recommend spending a little more. There are a few decent nonstick pans in this price range. They cost a little more than you’d probably budget for, but they have a reasonably better construction that will last a little longer. If you are looking for top rated nonstick cookware, you’re sure to part with between $200 and $300. Cookware sets in this price point are certainly not for everyone but they pack a great deal of features and in some occasions include utensils to match the price you’re paying. Choosing a decent set of nonstick cookware can be confusing. What is the best nonstick cookware set brand? Which material makes the best nonstick cookware? What nonstick cookware is safe? Answering all these questions can be tough when you know nothing about the stuff. If you are ready to buy a new set of pans, consider the top 10 nonstick cookware brands on the market, listed below. The All-Clad have a handsomely designed cookware set for home cooks and gourmet chefs who want top-tier products thoughtfully made to give them that ultimate cooking experience. It has exceptional heat distribution and a heavy construction with cool to the touch handles and slightly riveted edges to help you command any meal you are cooking with confidence. 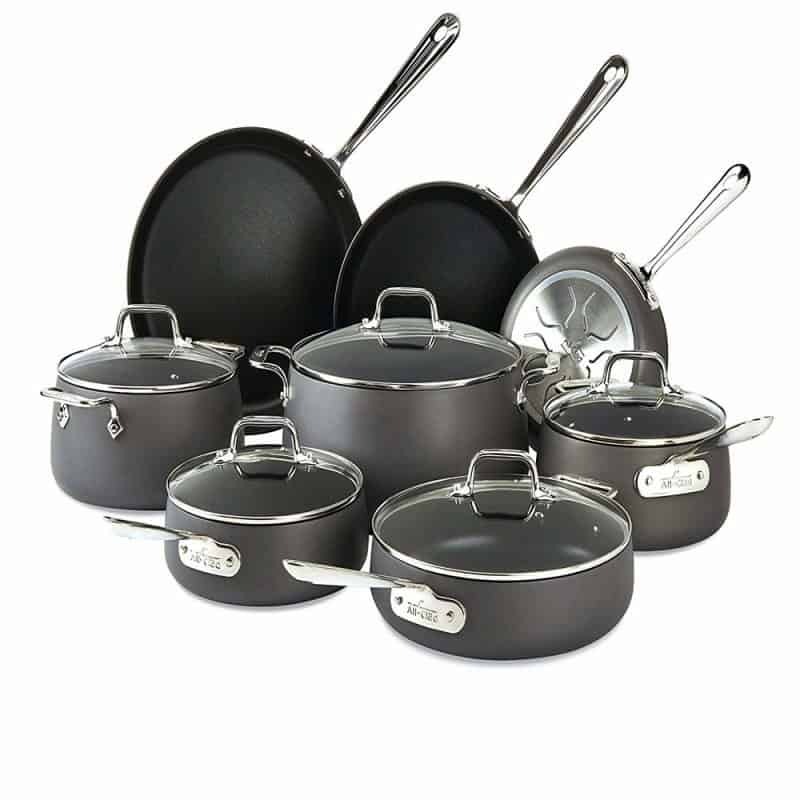 All, All-Clad cookware sets have three layers of PFOA free nonstick coating to ensure effortless food release and healthier cooking. Compatibility with all types of stovetops including induction stovetops. Ergonomically designed handles for a safe and comfortable hold. Can withstand oven temperatures up to 500 degrees. Secure fitting glass lid covers that allow you to monitor your food easily. 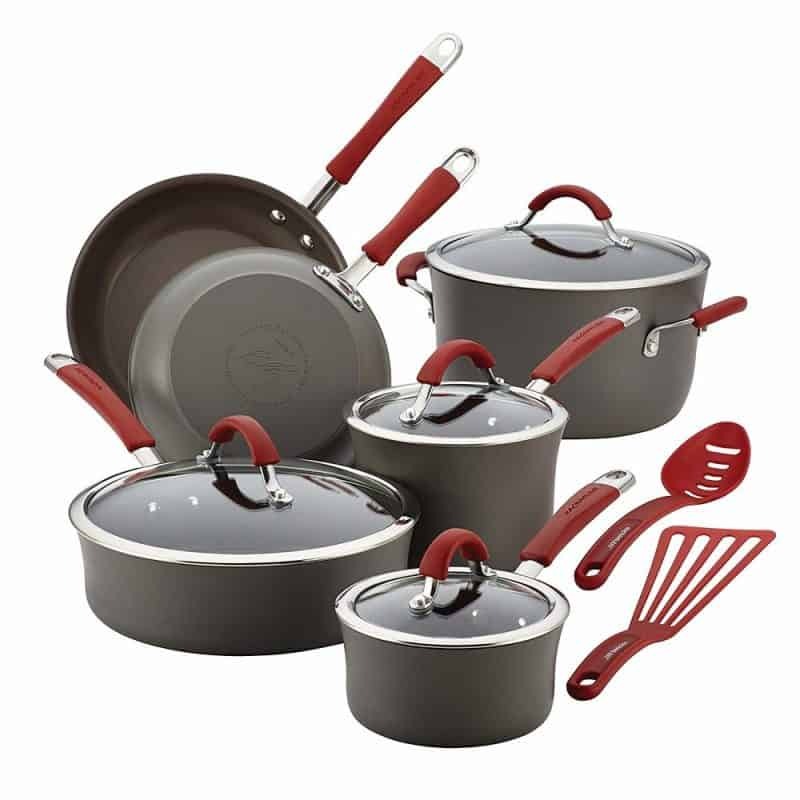 If the All-Clad set is out of your price range, we recommend the T-fal nonstick cookware set. It works just as efficiently as the All-Clad set but comes at a much lower price tag. 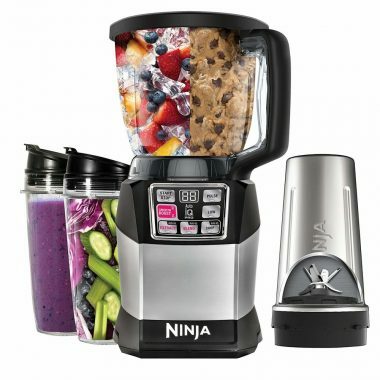 It features 17 pieces of cookware essential for day to day cooking and a unique heat indicator that shows you when the cookware is perfectly preheated to seal in the flavors and nutrients. In addition, the set also features riveted silicone handles that are not only safe up to 400 degrees but are also ergonomically designed for maximum comfort. Dishwasher safe to make cleaning up a breeze. Unique Thermo spot heat indicator that shows you when the pan is sufficiently preheated. All parts are made of PFOA, Cadmium and Lead-free materials that offer a health-conscious option. Vented tempered glass covers that lock in moisture and nutrients. Can withstand oven temperatures up to 400 degrees. Riveted silicone stay cool handles that provide a more comfortable grip and secure hold. 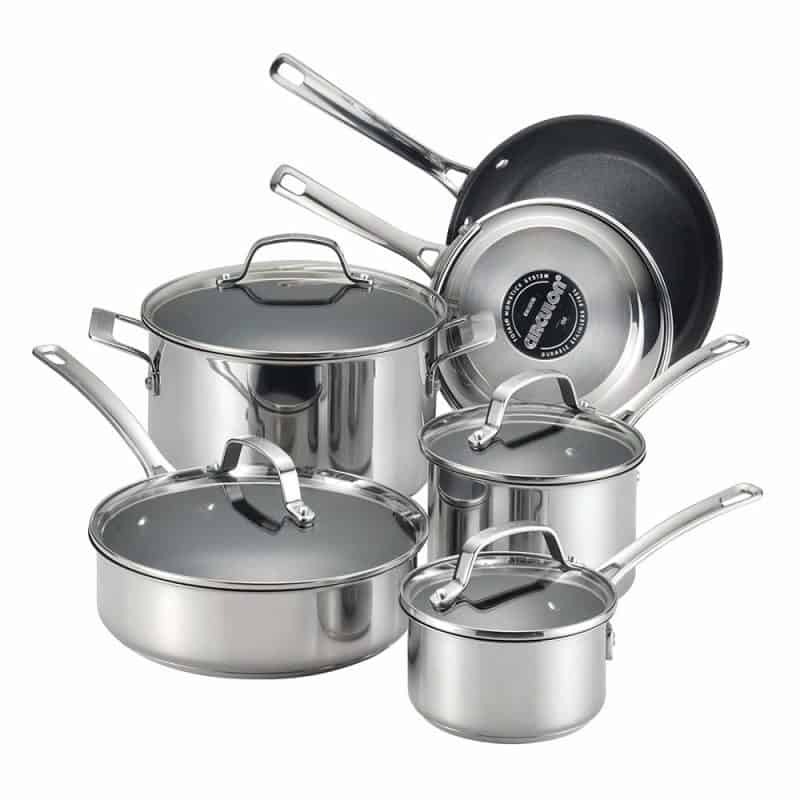 Heavy aluminum construction that ensures your pots and pans serve you for a long time. This set is worth every single dime you put into it. It is created with three layers of nonstick coating for ultra durability and has a heavy gauge aluminum construction for even heating. 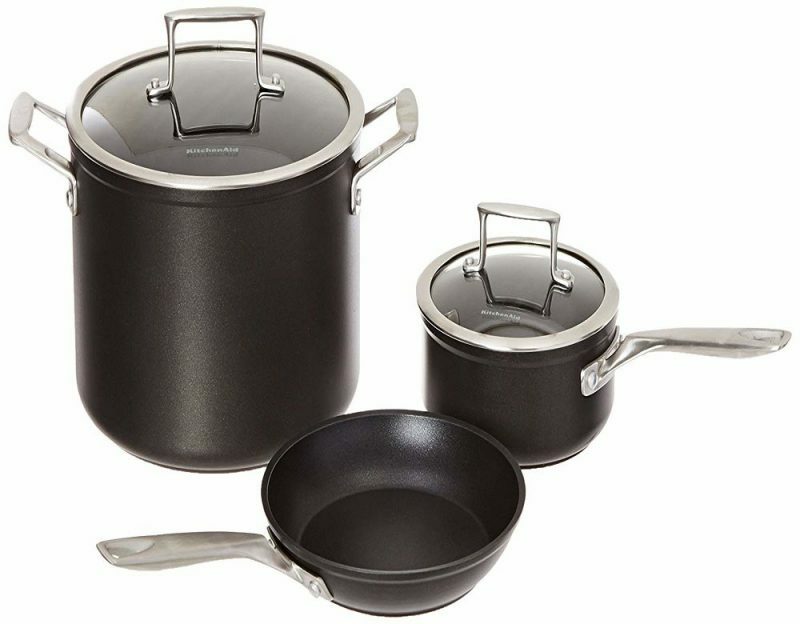 The Calphalon set also features long brushed stainless steel handles that remain cool even when the cookware gets hot. In addition, Calphalon contemporary utensils also have a smooth finish for easy food release and effortless cleanup. An elegant exterior that makes it look great as a kitchen centerpiece. Stay cool handles that remain cool even when the cookware is hot. Ergonomically designed handles that provide a comfortable hold. Clear glass lid covers that allow you to monitor food as it cooks. Dishwasher safe convenience for easy effortless cleanup. If you want the benefits of a high end set and don’t mind splurging a little more, the KitchenAid set is the one to consider. Comparable to most professional grade nonstick cookwares costing more, this professional hard anodized set puts a new spin to an old recipe to give you the absolute best. It features a nonstick colorfast finish that resists discoloring and fading and has three layers of nonstick coating for effortless cleanup. In addition, it has a stainless steel base that stays flat on all types of cooktops and a 5.5-millimeter thickness for long lasting durability. Clear glass lid covers that make it easy to monitor food while cooking. Do not let the low price fool you. Vremi is the best mid-range product out there. It comprises of multi-sized pots and pans featuring 15 pieces of nonstick cooking utensils made of premium durable materials that can handle just about any culinary task you want seamlessly. In addition, the cookware kit features ergonomically designed handles with hanging storage holes for easier storage when not in use and nonstick cooking accessories that help you whip up meals with confidence. All pots and pans are fine in ovens up to 300 degrees. They have vented glass lid covers that allow you to monitor your food as it cooks. Ergonomically designed handles with hanging storage holes for ease of storage. Compatibility with both gas and electric stovetops. They are lightweight and fit perfectly into a camping bag. Although it doesn’t have as many reviews as some of the other products out there, the oxo good grips nonstick pro cookware is a professional grade nonstick cookware set that has a handsomely contoured design and attractive ability to elevate your cooking. It features a German engineered 3 layer nonstick coating that allows for easy food release and facilitates an effortless cleanup and is constructed with a scratch resistant aluminum material that allows for even heating. In addition, it has handsomely contoured handles that stay cool even when the cookware gets hot and drip free edges that allow you to pour out food without spilling or pouring. Rounded bottoms that make it easier to stir food. It is constructed with high-quality professional grade materials that last for years. Nonstick coating with a smooth finish that allows for easy food release and healthy cooking. Tougher than most of its competitors, Cuisinart not only boasts of years of making great professional grade cookware but also a strong solid construction that lasts a lifetime. Designed from the inside out to meet the modern chef’s style and fancy, the Cuisinart set combines uncompromising superior performance with an attractively contoured look that makes it look great in any kitchen space. Titanium reinforced nonstick cooking surface that provides a smooth finish that allows for easy food release and healthy cooking. Ergonomically designed handles made of cast stainless steel that provide a safe and comfortable hold. Tight-fitting lid covers that lock in moisture, nutrients, and flavors. Tapered rims that ensure easy and effortless pouring. Compatibility with almost all types of cooktops. Riveted handles that stay cool even when the cookware gets hot. If you are looking for the most versatile piece in the Circulon lineup, this is it. This ideal set of pots and pans is an indispensable true chef’s product that can whip up an array of cuisines seamlessly. The Circulon set fuses the chic contemporary style of stainless steel with the healthy benefits of nonstick cookery and has a sturdy aluminum base that provides even heating on all types of cooktops. Additionally, all Circulon sets feature shatter-resistant glass lids that allow you to monitor food as you cook and a unique total food release system that allows for easy food release and healthy cooking. Can handle oven temperatures up to 500 degrees. Dishwasher safe to make cleanup a seamless task. Nonstick surface that allows for healthy cooking. Smooth nonstick surface that resists staining, scratching and chipping. Available in 3 different colors, this set is another quality option in the bunch. Available in an array of colors, Rachael Ray may not be a high-end nonstick cookware set parse but it stacks up a great deal of features that make it comparable to premium sets that cost a lot more. Boasting of hundreds of reviews, the Rachael Ray nonstick cookware set was definitely made with the top chefs’ needs in mind. It has an attractive rustic design that makes it the perfect kitchen centerpiece even when not in use and a hard anodized aluminum construction for even heating. Additionally, it also has silicone coated stainless steel handles with dual-riveted strength for a safe and comfortable hold and shatter-resistant glass lids that make it easy for you to monitor the progress of your food without opening the lid. Oven safe up to 400 degrees. Sturdy construction for long-lasting results. 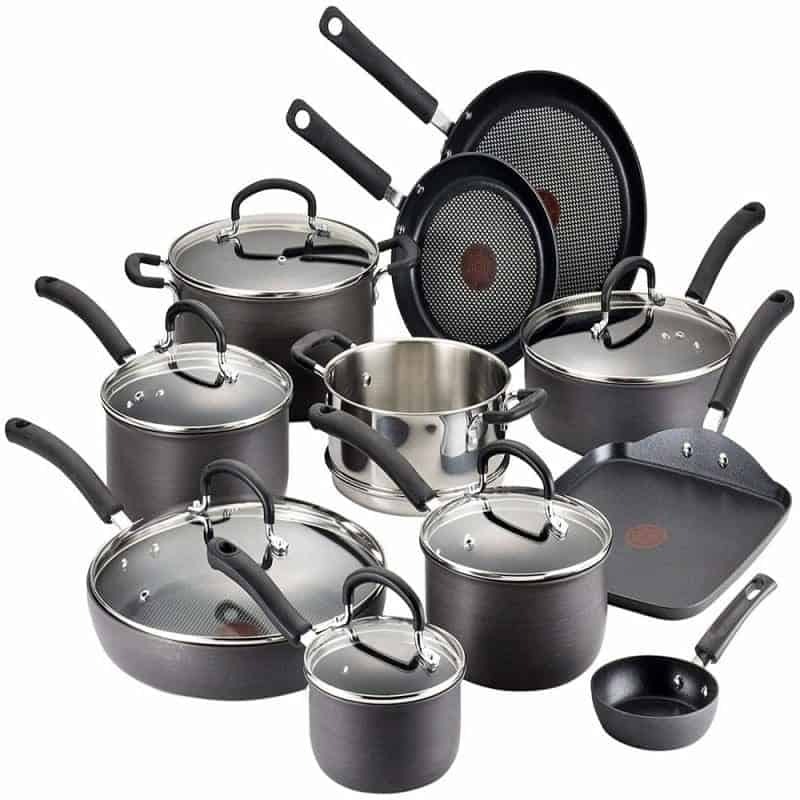 Last on our list is the Gotham steel nonstick titanium cookware set. Perfect for melting chocolate, cheese, and other toppings and seasonings, cooking stews, rice, soups, and steaming vegetables, Gotham Steel is one of the top cookware sets you’ll find on the market. PFOA, PTFE, and PFOS free to ensure hazardous chemicals don’t leach into your food. You need little to no oil to cook. Vibrant glossy finish that adds pomp and color to your kitchen. It is a simplistic minimalist cookware set. Smooth nonstick finish that allows for easy food release and effortless cleanup. Which is the best nonstick cookware? 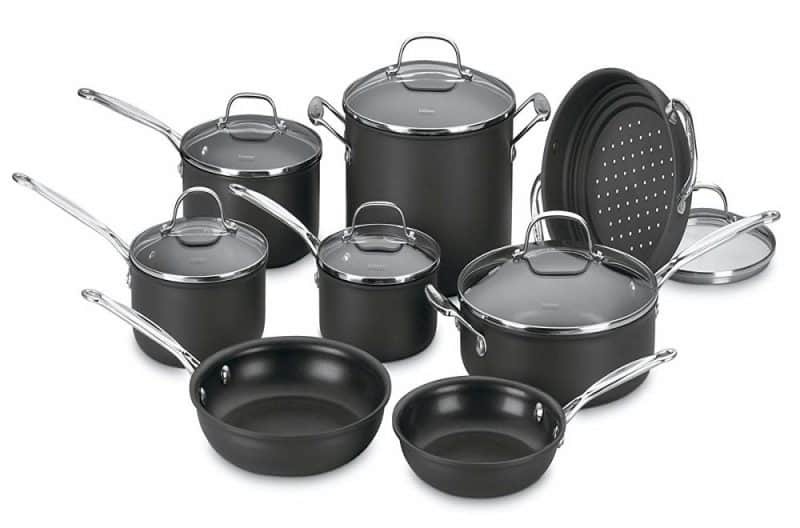 We can’t really point to just one set of cookware as the best mainly because the best depends on your preferences but All-Clad Set, T-fal Hard Anodized Cookware Set, Calphalon 1876788 Contemporary Hard-Anodized Aluminum Set, KitchenAid KCH2S5AKM Professional Hard Anodized Set and Vremi 15 Piece Set make are good enough top nonstick cookware sets that are handsomely contoured but still offer remarkable quality. Certainly not. Most sets are PFOA free so they are totally safe for your health. However, you still need to check to see whether the pans you are buying is PFOA and PTFE free before you make a purchase decision. Can nonstick cookware be used on an induction stove? Well, it all depends on the kind of cookware you have. While some sets are compatible with all stovetops, some are not. Therefore, it is important to check the manufacturers manual carefully so as to determine whether it’s safe to use your cookware on an induction stovetop or not. Are nonstick cookware sets dishwasher safe? It all depends on the brand. Some sets like Rachael Ray, Circulon and KitchenAid offer dishwasher-safe convenience whereas, for some brands, it is highly recommended that you hand wash as opposed to washing them in a dishwasher. As you can see, there are plenty of amazing nonstick cookware sets on the market. All of which offer amazing benefits. 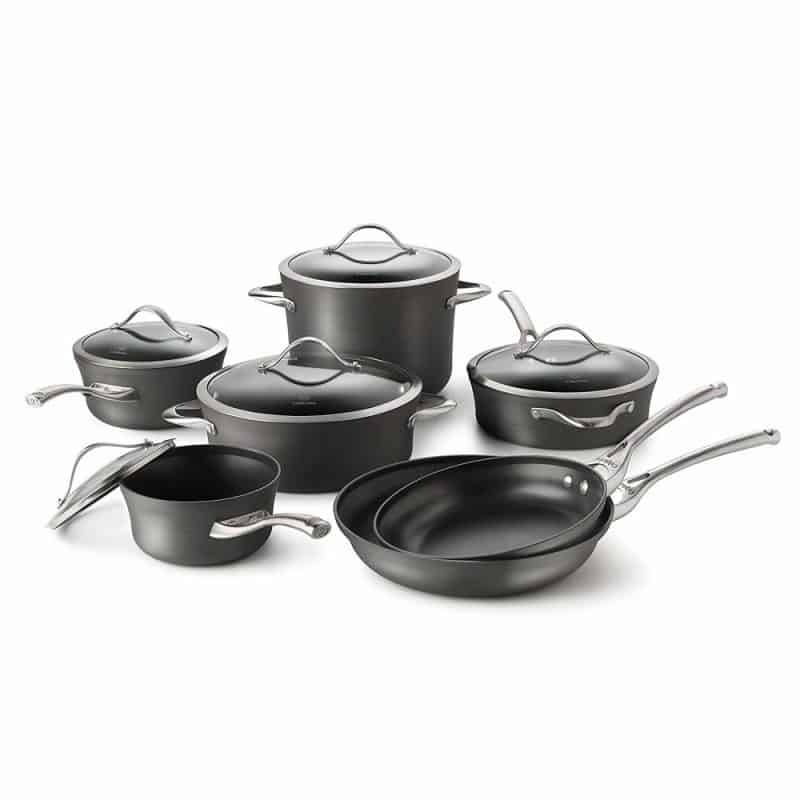 You’ll be sure to find a suitable set for your needs in any of the 10 top nonstick cookware sets on our list.